Today’s manufacturers face the compelling fact that customers have more power than ever before. To stay competitive, you need to meet increasingly rigorous customer expectations for high-quality products produced with short lead times and at low costs. To be able to be responsive quickly and effective to that you need to be able to exchange information between your shop floor and your enterprise information systems. If you’re like most manufacturers, it’s a tall order especially when commitment of this information to paper by machine operators followed by manual input into the MES - ERP system afterwards is the norm throughout the industry. Thus it’s a big challenge for most manufacturers to have this process automated. Up to now, you had just a few possibilities for automated data acquisition: External Operational-Data- or Machine-Data-Acquisition devices, additional Programmable-Logic-Controllers (PLC’s), OPC (OLE for Process Control) solutions or manufacturer specific solutions for certain machine types. In case external Operational-Data-Acquisition-Devices are used, apart from an often times high price, continuous attention of the machine operator is required. Alongside to potential problems due to non-acceptance this also results in high levels of data redundancy and inaccuracies caused by human error. Collection of useable data with Machine-Data-Acquisition-Devices or external Programmable-Logic-Controllers necessitates, in addition to an extra network connection, pulling of cables through the machine to its signal outputs what, apart from the high effort for installation also requires detailed knowledge of the machine’s hardware. Due to the fact that OPC-Programs are only able to access data of the machine’s integrated PLC alongside to the required installation of an additional communication module and detailed knowledge about the manufacturer specific programming of the PLC it has to be taken into account that often-times access of the PLC’s data by third-party drivers is necessary that are not approved by the machine manufacturer. Manufacturer specific solutions for data acquisition that are offered by some manufacturers for their machines usually can only be used for machines of the respective vendor. In the rare ideal case where a matching client – server solution for all engaged machines can be found it still has to be taken into account that this always leads to multiple servers and programs with their own MES - ERP interface that have to be purchased, installed, configured, operated and maintained separately. Modification of a machine regularly means a deep encroachment on a combination tested by the machine manufacturer. Alongside from being costly and time-consuming such technical change may lead to serious questions concerning the factory acceptance test (FAT), warranty, maintenance and service of the machine. In a typical manufacturing plant that usually consists of newer and older machines with different controllers from various suppliers these restrictions impede the automatic acquisition and provision of relevant information in a timely manner required to improve performance across the enterprise. How can accurate data be automatically acquired and transformed into in a consistent, comparable form with no additional hardware and no or an absolute minimum of required user input? How can a typical machinery park be integrated with an existing MES - ERP solution with an acceptable effort in terms of time and costs? How can modifications of a machine and the potential influence on its function, warranty, maintenance and service be avoided? How can machines from different manufacturers work simultaneously with one program on one single server? The answer to these questions is: CNCnetPDM – a worldwide unique software technology that provides a direct connection between production facilities and business operations. The machine communication layer (1) directly communicates with the machine’s existing data interface and queries all required information by utilizing manufacturer specific software interface modules. For every type of machine a different module can be used within a single instance of the background service. The processing layer (2) receives and validates the requested data, transforms it into a homogenous format and makes it available to the MES - ERP communication layer. The MES - ERP communication layer (3) forms suitable data packets from the received information and transmits them to the MES - ERP system. implementation can be performed in a timely, cost-effective and most of all reliable manner. Actuality of the data: Manufacturing-related data acquired by CNCnetPDM is ensured to be visible in near real time – including all information needed for process improvement and enhancement of transparency. By enabling manufacturers to align data from production resources with business processes CNCnetPDM allows enforcement of measures to optimize flexibility, efficiency and effectiveness. 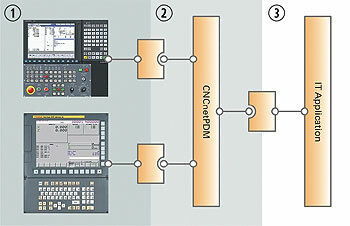 Manufacturing synchronization: CNCnetPDM provides a single layer for integration of different types of machines with MES - ERP by which manufacturing and business processes can be synchronized. By linking your manufacturing processes with enterprise processes and master data, CNCnetPDM gives you the visibility and control you need to operate different manufacturing resources based on a single version of truth. The result is increased power to monitor your progress and follow through on the corporate-level strategic initiatives that result in long-term competitive advantage. Quality of data: Without factory and ERP systems integration, many companies find themselves intervening manually to enter production batch data. Alongside to the emerging time displacement this method only allows a very basic acquisition of data because the input of all details would result in a disproportional expenditure of time and money. Without any or an absolute minimum required user input CNCnetPDM automatically translates manufacturer specific machine data into understand- and comparable messages. This ensures a maximum of data quality with a minimum of effort. Improvement of transparency: It's almost impossible to detect bottlenecks within the production chain or to make an error analysis if there is no convincing data. This data needs to be delivered to the right person in the appropriate context in an timely manner. Because CNCnetPDM converts the relevant information of all machines into a uniformly standardized output format the production process can be traced and analyzed over various types of manufacturing devices in near real time. Costs for acquisition, implementation and operation: Apart from a detailed knowledge of the machine’s hardware or the manufacturer specific programming of the machine’s PLC solutions for automated data acquisition available up to now in most cases require additional hardware and modifications of the machine. The encroachment on a combination tested by the machine manufacturer is costly, time-consuming and leads to questions about maintenance and warranty. CNCnetPDM works with certified software interface modules that are customized for the according type of machine. The required information is directly queried via the machine’s existing standard interface and instantly gets processed by CNCnetPDM. Due to the fact that a single instance of the background service can be equipped with multiple machine specific software interface modules a single server can be used for the whole machine park. All tasks needed for setup, configuration and maintenance of CNCnetPDM can be performed from a remote location, physical presence at the machine is not required. Apart from attractive operating costs this results in appreciable reduced costs for implementation and maintenance.